We score our games on a letter grade scale as of 2010, from A+ to F-. Prior to 2010, we used a numeric scoring scale of 0.0 – 10. We made the change to letter grades because we felt they were a lot easier for us to give and a lot easier for readers to understand. We’ve spent far too many years wondering why a “7.0” on a 10-point scale is the “middle” (years of grade school aside), and we’ve decided to silence that debate with letters. What’s up with the mushrooms? 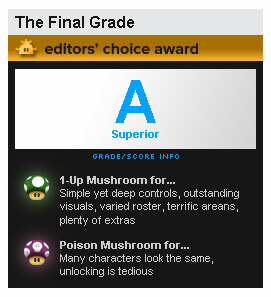 In 2010, we also added our iconic 1up and poison mushrooms to our game reviews’ score box. They give you a quick way to read what we feel are the biggest pros and cons of a game. What makes a game “Editors’ Choice”? Some games are so great that we feel you should buy them, regardless your genre affection. Oftentimes these are games that are given an A or an A+, but not every single “A” game gets an Editors’ Choice badge– each Editors’ Choice winner is considered individually. Why do some scores have a little asterisk, like “Excellent*“? Please note that our archived reviews still have their original number scores, but we’ve translated them on the website into letter grades for consistency. To preserve the reviewers’ original intents, however, any converted scores are identified with an asterisk– that’s just to let you know the score wasn’t originally a letter. We use Metacritic’s methodology to determine how to convert our number scores to letter grades. What’s the full list of grades and their descriptors? Glad you asked. We know you probably never saw an “F-” in school– F is F, right?– but we’re including it so that every letter grade is treated with the same number of skews.